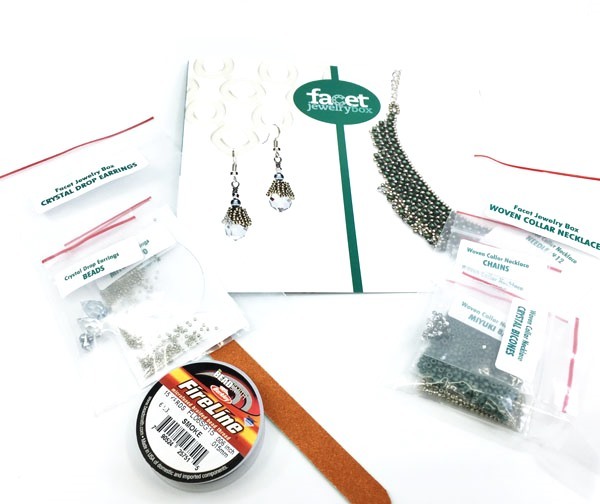 Did you know the folks at FacetJewelry and Bead and Button Magazine also offer a DIY jewelry subscription service? 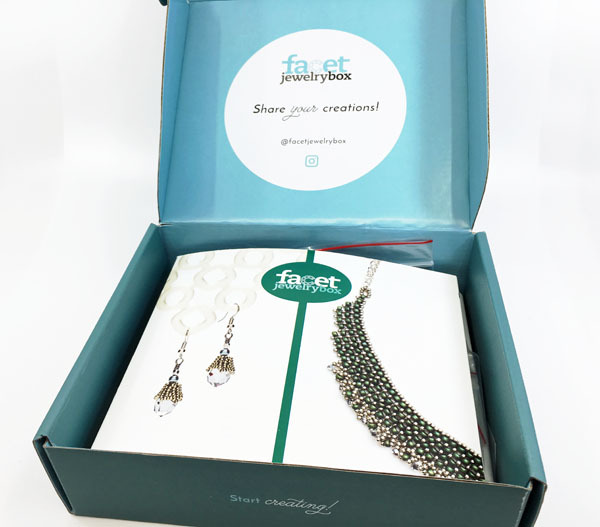 The Facet Jewelry Box offers monthly or quarterly boxes . 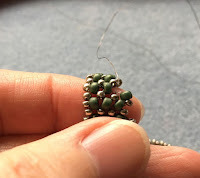 There is a choice of technique - one for stringing and one for beadweaving. 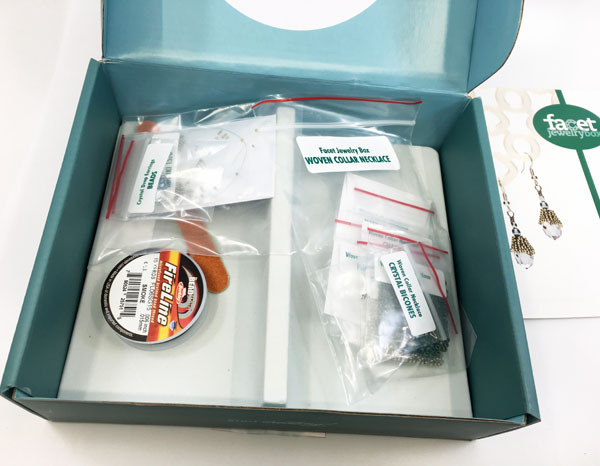 I recently received the beadweaving box for review. The reveal was a lot of fun as I didn't know what was inside! There are two separate projects in all their subscription boxes. Lying right on top is the beautifully produced instruction book. The box is divided with the materials for each project in the right place. There was even an emery board to file away rough wire ends. The wire work is basic a simple wire wrapped loop technique for the earrings. The quality of the supplies was excellent. There were two needles provided - one for each project. As it turns out, this is a good thing because I broke a needle when making the pieces up (see final photos below)! The supplies list was carefully thought out to ensure the user did not have to buy anything else to complete the projects. You do have to have other tools on hand like scissors and basic pliers, which are not provided. 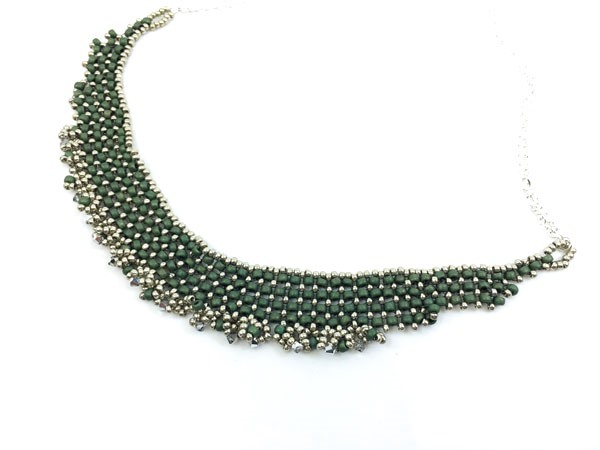 ......and the RAW (right angle weave) bib style necklace. The projects are not hard. Beginners - or those a little rusty with bead stitching - are given links to follow in the instruction booklet if they needed to see a video etc. Just one further tip for newbies on RAW. 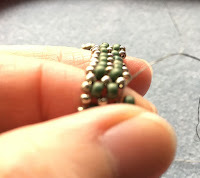 If the just strung on bead is "floppy", you might find it harder to see the pattern enough to continue. Moreover, the beads (the green ones in this case) might not be neatly aligned. 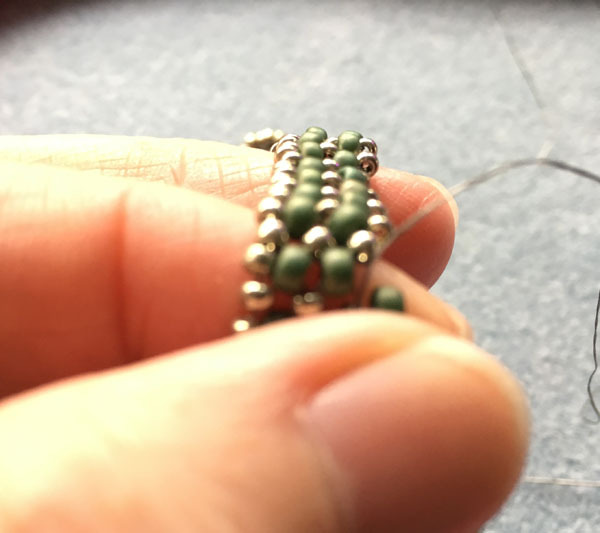 So pinch the loose green bead in place before you proceed. Beadaholics can find it difficult to regulate their beading habits. So these subscription boxes not only provide wallet friendly project pacing but also eliminates the need to shop for materials. This is especially useful for people who can't get out easily or are far from bead shops. If you can and do have other supplies, you could make up more pieces of the same designs now that you have the pattern! Also check out their Facebook and their Instagram to see what the team is up to! Interested? Readers can get 50% off their first box when they use the code HALFOFF at checkout. 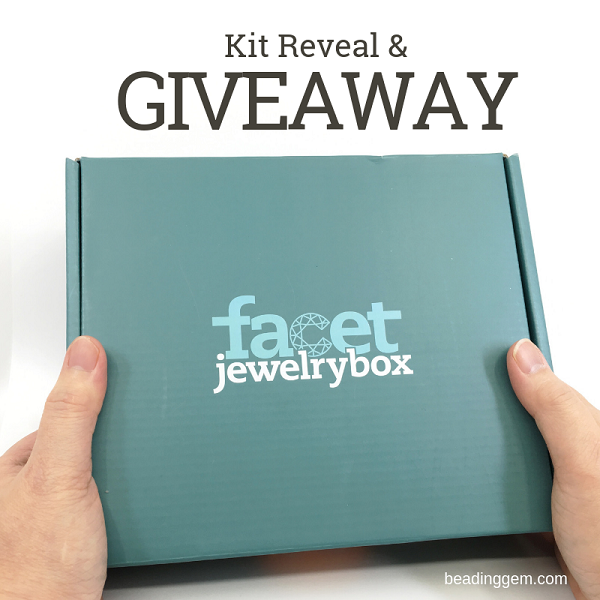 If you'd like to win this giveaway for this beadweaving Facet jewelry box, please make a comment below. Make sure you leave contact info below if you do not have an online shop or blog. It ends in a week's time at 6 pm EST Monday, December 3, 2018. I will pick the winner randomly and announce the results as soon as possible after. So be sure to leave a contact email if you don't have an online link or make sure you come back and check! Otherwise I will redraw in a week. Good luck! What a lovely kit! I'm going to head over and check out their website. Thanks for this opportunity Pearl! That looks like a lot of fun. I love those projects too! Oh how exciting! Thank you for the opportunity to win! What fun this would be! I need to check out their site. I am always looking for new beadweaving projects! I am a subscriber and FB follower. I’ll give a shoutout to my sister, Karla Schafer, as well! Thank you for the opportunity to win! I love getting my Facet Jewelry newsletter in my inbox. They have such beautiful and creative designs and offer so much help as well to anyone who asks. I think they love making jewelry so much that they are happy to share the joys of doing so. I've been looking at their boxes but haven't tried one as yet. I tend to like to do things myself, so I've put it off. Perhaps winning one would get me hooked. Wow -looks like a great project box! Thanks for sharing! What a nice idea... going to go and check them out. Thank you for sharing.. The necklace is amazing! It looks like a very organized box of goodies. My biggest struggle is always picking out everything I need, and often, I am left with something missing. This would let me start...and finish, without having to put it aside until my next shopping trip. I have seen these before because I subscribe to their emails and have wanted to get in on it, but budget is nonexistent. I love that it come with everything that you would need to do more than one creation. 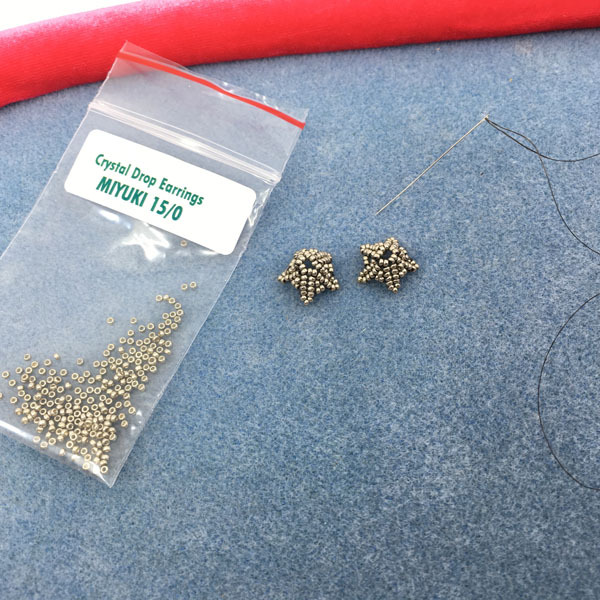 I live in an area that doesn't have any bead stores, so I have to do everything online. This box would be really handy. I think that it would also make an awesome Christmas gift for the people that love to create things and seem to have everything (you know the ones that are really hard to buy for). Plus who doesn't love a mystery box gift- so exciting when you finally get to open it up and see inside. I love surprises, and a jewelry-making kit would contain the most wonderful kind of surprise! Thanks for the chance to win! Oh my goodness! What a wonderful prize to win! 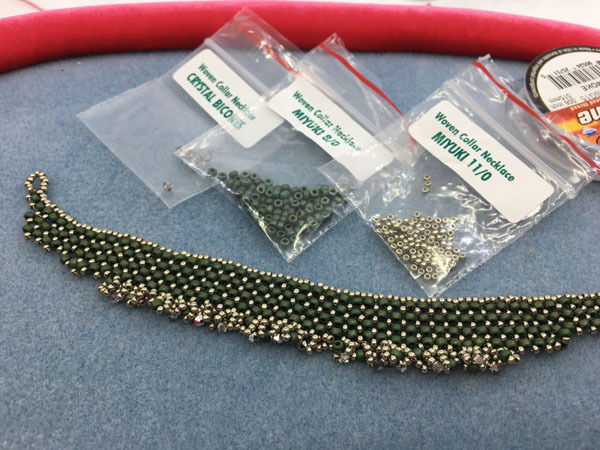 Love the jewelry that can be made with it! Thanks so much Pearl for hosting another giveaway! Love the idea of not having to shop for supplies as well as learning something new. I would love to win this giveaway. Lots of nice items. It's like getting a Tiffany blue box. Oh yes! Having the "shopping list" done for a project sounds wonderful! I have been curious about the "Box subscription" and as always you presented it in a way so that it did peak my interest. Yes it would keep me out of the bead stores, but someone has got to support them. I would love to get one in your giveaway. 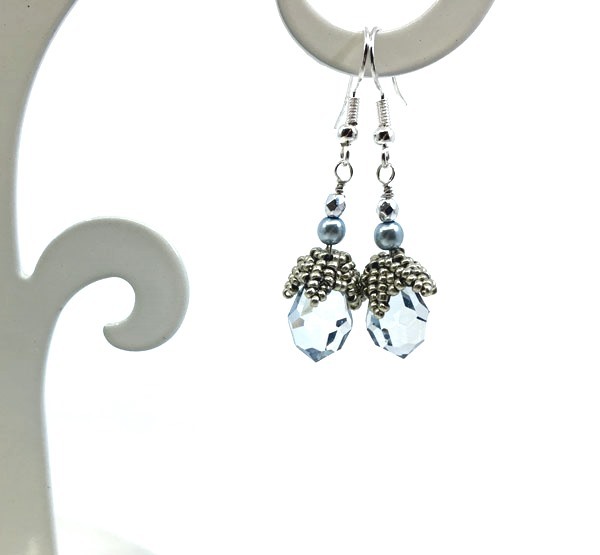 I would not only get to make the earrings and necklace but also have a couple of new patterns ! I've been wanting to find a bead box subscription, so I would love to win one to try! I would love to win This AWESOME prize the jewelry is beautiful thanks for the chance to win. Such a great idea and such beautiful projects! Have always wanted to try a RAW project and this one looks like it could be it. It's gorgeous.